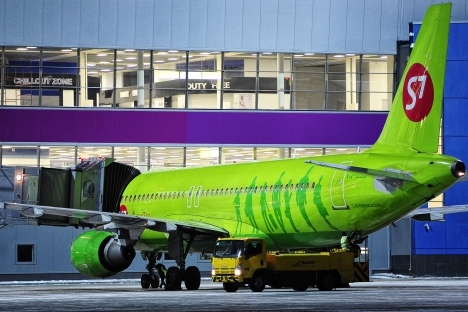 Co-owner of Sibir Airlines (a member of S7 Airlines Group) Vladislav Filev has signed an agreement to buy "at least 51 percent of the stock of Transaero from Alexander Pleshakov," an S7 representative told Interfax. According to RBC, S7 General Director and co-owner Filev and Pleshakov signed the agreement on Tuesday evening. The media outlet said the top manager of one of the company's creditor banks was aware of the deal. The sides did not disclose the cost of the deal but RBC quoted Pleshakov as saying that the block price "was much larger than one ruble" and that the cost "would satisfy all parties to the deal." S7 shareholders "have a plan for settling relations with Transaero's creditors," Filev said without going into detail. He only said that the new shareholders "would do their best to avoid the airline's bankruptcy." Aeroflot did not comment on the acquisition of the block of Transaero stakes by the Sibir shareholder. Transaero, which had accumulated about 250 billion rubles in debts and an excessive fleet, found itself on the brink of bankruptcy in September and forced the government to start searching for variants of its salvation. It was planned to sell 75 percent of the company stock plus one share to Aeroflot for one ruble, but Transaero shareholders failed to consolidate the block of shares on time. As a result, Aeroflot withdrew its offer and government officials said that bankruptcy was the only possible option. Major creditor banks, Alfa Bank and Sberbank filed bankruptcy claims against Transaero at the beginning of the week. VTB confirmed its intention to file the claim for the airline's bankruptcy.